This post will detail some little-known facts about the ancient world which confirm that the Old World and New World communicated and traded with each other millennia prior to when Columbus restored maritime connections between the two sides of the Atlantic Ocean in 1492. This connection is also verified in biblical historical narratives. It has been known for years that the mummies of ancient Egypt contain residues of cocaine and nicotine, and that Egyptian art includes depictions of New World corn crops. It has also been known for many centuries that nicotine was introduced to the Europeans after Columbus’ voyage and those of other European explorers brought samples of tobacco products back to European royal courts. That cocaine from the Americas could be found in very ancient Egyptian mummies so shocked the academic world that they at first dismissed such findings as modern “contamination” of ancient tissue samples. However, hair analysis confirmed the discovery (first link). The link notes that one explanation for the ruling elites of ancient Egypt to have cocaine and nicotine in their tissues was that they obtained it via a third party, by trading with the Americas. 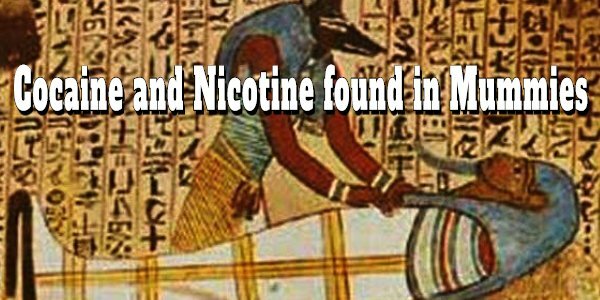 The second link affirms the valid discovery of cocaine and nicotine in ancient Egyptian mummies and speculates the Egyptians themselves were the ones who sailed across the Atlantic to obtain these products. The third link offers a web search link offering more perspectives on these discoveries. However, I think there is an easier explanation for how cocaine and nicotine came from the ancient Americas to ancient Egypt. The fourth link offers additional information on this connection, and it suggests the ancient Phoenicians (and their later Carthaginian offspring) were the traders who brought these products to Old World elites. This explanation makes sense to me and it is entirely consistent with biblical historical narratives about that ancient time. The Phoenicians dominated the maritime trading routes of the ancient world for many centuries. They especially controlled the world’s sea lanes prior to and during the time that the Phoenician alliance consisted of Tyre, Sidon and other trading city-states with the Israelites under Kings David and Solomon during the time of the United Monarchy of the tribes of Israel and, later, with the Israelite kings of the northern kingdom. The fourth link includes a discussion and depiction of a Carthaginian coin (circa 341 BC) with a depiction of the New World on a global map, similarities between Old and New World pyramids, and depictions of New World corn on ancient Egyptian art. It also discusses a theory that the biblical trading destination of “Ophir”‘ was actually Mexico due to the similarity between the names “Yucatan” and “Joktan,” a forebearer of Ophir (Genesis 10:25-29). It also reproduces a depiction of what had been labeled as “incense spoons” on ancient Egyptian art. However, now that it is known the elites of ancient Egypt were ingesting cocaine in some manner, those devices may have been inhalation cocaine-delivery systems. Almost certainly, New World cocaine would have been a very high-price trading commodity that only the pharaohs, priests and elites of ancient Egypt would have known about or have been able to afford. One can see that Egyptian priests and pharaohs would have sought the help of hallucinogens to facilitate an experience of communing with their gods in Egypt’s temples. Cocaine and tobacco would have been high-value trade goods brought to Egypt by the Phoenician traders who dominated the ancient world’s maritime routes at that time. It would not have been difficult for Phoenicians (and their later Carthaginian colonists) to have had regular trading routes between the Old and New World. To make that point, look at a globe or world map. You will see that the distance from West Africa and the Azores to the coast of Brazil is actually less than the distance from the Phoenician/Israelite seacoast to Gibraltar. They would have sailed with the trade winds that circle around the North Atlantic region: westward to the New World and then returning via the North Atlantic trade winds to Briton and Europe on their way back to the Mediterranean Sea. The Bible contains ancient confirmation that these oceanic trade winds were known to the Phoenician/Israelites. Ecclesiastes 1:6 contains a clear description of these circular trade winds that the Phoenician ships would have utilized. It is generally forgotten that the “Phoenician” alliance included not only the small city-states of Tyre, Sidon, and Byblos but also the more-numerous tribes of Israel under Kings David and Solomon and the later kings of the northern kingdom of Israel. King Hiram of Tyre reached out to King David to make an alliance between their two peoples (II Samuel 5:11-12). Under King Solomon, David’s son, this alliance became so close they were a merged people. King Hiram’s mariners taught all their maritime knowledge to the Israelites and they merged their fleets, bringing back cargo and wildlife sample from voyages to other continents (I Kings 9:26-27, 10:22). The “Phoenicians” never called themselves by that name. The Greeks gave them that name, and we know them by that name only because our western histories are based on Greco-Roman sources. It needs to be realized that as we read the biblical historical narratives from the time of David (circa 1000 BC) until the fall of the northern kingdom of Israel, we are reading the history of the ancient Phoenician Empire–which was the Israelite Empire allied to the small city-states along what we call the Lebanese coast. How far did the sailors of the Israelite/Phoenician Empire explore? We do not know the exact age of the book of Job, but it was clearly part of the Israelite heritage. Job 38:29-30 refers to a location where the waters are as hard as stone and the “face of the deep is frozen.” This clearly shows the ancient Israelites knew about the polar ice caps so they clearly traveled to those far-distant regions. Isaiah 40:22 refers to the “circle of the earth,” clearly showing the Israelite mariners knew the earth was round–an inevitable conclusion made by those who sailed all over the globe. There is an interesting narrative in I Kings 18 that occurred during the great drought upon the northern kingdom of Israel that Elijah had pronounced upon them due to their growing and heinous sins. Elijah had been hiding from King Ahab for some time, but finally revealed himself. An aide to King Ahab remarked that Ahab had been searching everywhere for Ahab and that “there was no nation or kingdom” that Ahab hadn’t required their governments to search for Elijah and “took an oath” they had not found him. If Ahab was just the head of a petty shepherd kingdom, there is no way that this could have occurred. Ahab would have lacked both the clout and ability to demand all kingdoms everywhere search for Elijah–one of Israel’s citizens. However, when it is understood that King Ahab was the ruler of the Phoenician Empire that dominated the globe’s maritime trading route, this is understandable. If Ahab, the king of the Phoenician alliance made a demand, all kingdoms linked by those trading routes had to do what Ahab said or their goods could have been banned from the international trading routes. Ahab had that power as the commander of the world’s greatest navy at that time. The Phoenician alliance was clearly still very strong then as Ahab was married to a princess of the royal Sidonian house–the wicked queen, Jezebel (I King 16:31). There is a hint of possible cocaine use by a monarch in the Bible. When Solomon grew older, he forsook God’s laws and abandoned himself to human pleasures. He had 1000 wives and concubines in his harem (I Kings 11:3-4) and in Ecclesiastes 1:17-2:3, Solomon wrote that he “gave [him]self to wine,” and to “enjoy pleasure” and sample “mirth,” “folly” and “madness.” (KJV). In other words, he likes to “get high” as he partied. Enough cocaine would have induced a state of temporary “madness” in him. Since the Phoenicians were almost certainly the middlemen who obtained cocaine for Egyptian royalty and elites, and since Solomon was the king of the Phoenician Empire, he certainly had easy access to it as well. Obviously, the ancient writers of the Bible had no word for “cocaine,” but they could describe its effects. Isn’t it amazing what can be deduced when we realize that the Israelite Empire of the Bible was the Phoenician Empire described by the Greeks? This provides a very logical explanation for the methodology via which the ancient Egyptian pharaohs and elites obtained access to Old World cocaine. I Kings 7:8 records Solomon had married a daughter of Egypt’s pharaoh at that time so the Egyptian and Israelite/Phoenician royal houses intermarried as well. The cocaine that was available to the Egyptian ruling classes was just as available to the rulers of ancient Israel and their city-state allies. The global commerce between the Old and New World in many different ancient historical periods and a thorough history of the Israelite/Phoenician Empire is documented in my E-book, The “Lost” Ten Tribes of Israel…Found! and my printed books, The Origins, and Empire of Ancient Israel and Israel’s Lost Empires, all of which are available on the homepage of my website. There was a great deal of commerce and cultural exchange between the Old and New World in ancient times. It was during the well-named Dark Ages and the Medieval period that these links (and many other types of knowledge) were lost and finally regained again as the Renaissance period began. So cocaine was ingested by the upper classes on both sides of the Atlantic in ancient times? This should not surprise us. It was Solomon himself who observed that “there is no new thing under the sun” (Ecclesiastes 1:9-10).